A little Spring cleaning! RichardReddy.ie gets a new lick of paint. 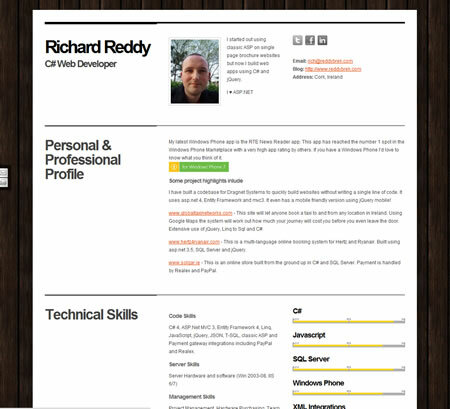 I've been very busy over the last few weeks working on some interesting MVC 3 projects but one of the things I was meaning to get around to was redoing my own RichardReddy.ie website. I had let the domain just sit there for about 12months but thankfully I had some time over the weekend to get a simple 'CV' style site up and running. I will be launching another 2 personal sites very soon to highlight my mobile work. I've been having a great time developing for Windows Phone and I'm hoping to make some more apps for the phone very soon so having a website/portal showcasing my work makes sense. All going well these should be live before the end of March.